Finally! A decorative wall register option that allows you specifically match your decor! This round air vent cover can be purchased in 18 different decorative designs and 15 decorative powder coated finishes. The durable powder coated finishes resist scratching and chipping. Each decorative wall register comes with a fully adjustable steel butterfly damper that can be controlled through the faceplate with a flat head screwdriver, even after the vent is installed. SteelCrest round registers are made in the USA. Please note: This round register cannot be used on the floor. For round floor vent covers, please see the SteelCrest Round Floor Return Grill. This round register features a steel damper that controls airflow. Please see our butterfly damper instructional sheet. Round register has a drop in depth of approximately 2"
Thickness of faceplate is 1/8"
Tip: When measuring for your new decorative vent, you will want to measure the diameter of the actual hole in the wall and order that size grille. For example, a 12" diameter round hole will need a 12" round grille. The outside measurements will be 1.5" larger than the listed size. Round decorative wall registers can be custom made to your specific hole and faceplate sizes. Measure the diameter of the round wall opening and call our customer service team at 866.258.1554 for pricing. Our offices are open Monday-Friday 8am-5pm CST. Important: All SteelCrest round registers, both standard size and custom size, will take 5 to 8 weeks to be manufactured and shipped. There are rush shipments (2 to 4 weeks) available for an extra charge (please call for information). 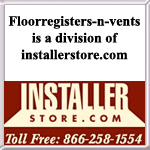 All round floor vents are special order, non-returnable and cannot be canceled once payment is received. Please contact us with any questions on these vents or color sample requests. For a small deposit fee, color samples of the finish choices can be mailed to you. Once returned, the deposit will be refunded. This custom decorative wall register for wall/ceilings can also be purchased as a return air grille (no damper). 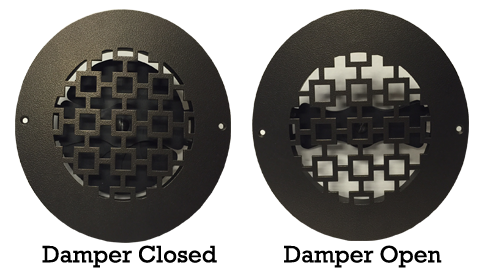 Upgrade your wall/ceiling round registers to these decorative SteelCrest vents today!